Anna: If you really love me as you say, give me back my peace of mind. Vronsky: I never knew what peace was, so I'm unable to give it to you. I can only give you all of myself and my love. Leo Tolstoy is renowned for his massive and influential novels, which have proven singularly difficult to adapt for motion pictures. When dealing with 700+ pages of dense text, something substantial can hardly help but be left by the wayside, with only the barest skeleton of the plot surviving on the screen. 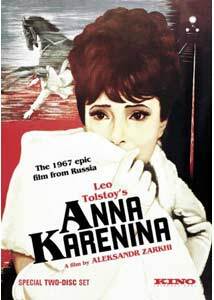 That problem afflicts this Russian version of Tolstoy's epic romance Anna Karenina, but it remains one of the most faithful adaptations of the novel to date. The title character (Tatiana Samojlova) is a dutiful wife to Karenin (Nikolai Gritsenko), a minor political functionary, and mother to a young son, when she meets a dashing young military man, Count Vronsky (Vassily Lanovoy). Something sparks between them, and soon they are madly and passionately in love. But such an illicit relationship is very much frowned upon in polite Russian society, and there are numerous consequences to their love. But by the same token they find themselves unable to live without each other, and so their relationship is subject to severe stresses as they try to live their lives in peace. The skeleton that survives is the outline of the central romantic relationship and its interaction with the world around it, which is clearly a vital part of the story. But the parallel story of Lyovin (Boris Goldayev), or Levin as he's more commonly known, the ineffectual intellectual, naturally gets short shrift. Of course, lengthy passages of dreary Czarist political discourses wouldn't have made good cinema (and probably would never have been acceptable in Soviet film in any event), but as a result Lyovin's story become reduced to a mere caricature as he pursues the brainless though charming Kitty (Anastasia Vertinskaya). Lyovin is nonetheless an essential part of the novel, as the persona of the author himself, and he does get one good moment here that spells out his philosophy wordlessly. In that short segment, he is seen swinging the scythe in the fields alongside the peasants in a beautifully shot sequence, which elegantly boils down the character in a few seconds. The leads are excellent, with Samojlova (who was memorable several years earlier in The Cranes are Flying) giving the title character the appropriate intensity of emotion, balancing her passion with her affection for her young son Sergey and pain at her situation. Gritsenko is excellent as the wounded Karenin, angry, hurt, mournful, desperate, and resigned by turns, running the gamut of emotion in limited screen time. Lanovoy gives Vronsky a charm and wit that makes him quite well rounded; unlike Hollywood versions of the story, he conveys Vronsky as being something more than a pretty boy in a sharp uniform. Among the supporting cast, ballerina Maya Plisetskaya lends a regal bearing and grace to her portrayal of Princess Betsy that provides an unspoken sense of class distinction. Composer Rodion Shchedrin provides a notable score for the picture, melding classical influences that root the story in the 19th century with dissonances that give the story a very modern feeling. Several critical sequences, such as the ball where Vronsky and Anna meet, are greatly heightened in effect by the musical score, which provides the joyous exuberance with an undercurrent of ominous disaster, foreshadowing the consequences of the event. Director Alexkander Zarkhi keeps plenty of Tolstoy's foreshadowing and symbolism (especially that related to trains) throughout the film. There is some strikingly fluid camerawork by Leonid Kalashnikov when one considers this is the pre-Steadicam era, tracking with Karenin and Anna as they walk through their house, in endless moving takes that give one a sense of the space (or in some cases, the limited space) in which the characters live. There are also several point-of-view shots that are equally effective, and on occasion such shots suddenly switch to reversals, shifting emphasis and changing the tone from one of introspection to a more neutral observer status. While the second half has some issues (mostly due to compression producing a slightly disjointed sensation), as a whole the presentation works well and satisfies far better than other efforts at translating the novel to the screen. Image Transfer Review: The anamorphic widescreen print is in reasonably good condition for the most part, with minimal damage (though some warpage is visible early on). The main problems (and they're not insignificant) are related to the unstable color. There's a persistent flicker and lack of stability that is often distracting. Skin tones come off worst, shifting uneasily between white and red, or blue and yellow, depending on the background colorations. I expect that the lion's share of these issues are related to poor Soviet film stock of the era. The picture is somewhat soft, but on occasion there is plenty of detail (such as in Anna's black veil). Black levels are reasonably good, though shadow detail is a bit lacking. Kino may have been limited in what was possible with these source materials from Ruscico; other Russian films of the era have been released in much worse shape than this. Audio Transfer Review: The original Russian is rendered in an undistinguished and rather flat mono, though Shchedrin's score has good presence and reasonable range for a mono track. English and French 5.1 dubs are also presented, and they're rather crude at times. The music is often very shrill on these tracks. The dubbing is crude on all three versions, but the Russian is easily preferable. Extras Review: Kino seems to have taken to heart the criticisms we made of their Tchaikovsky DVD, keeping the film intact on the first disc and dropping the unskippable copyright notices on the second disc, making for a more coherent and pleasing presentation. All of the non-text extras are in Russian, with English, French and Spanish subtitles. The second disc starts off with a text bio of Tolstoy and a substantial documentary (21m:40s), which gives good emphasis to his philosophy and his influence on Gandhi, among others. Should you like more Tolstoy, there is a selection of newsreel footage (10m:50s) of the author and his family, as well as coverage of his 1910 funeral. A brief making-of featurette seems to end abruptly, but it features a short, period interview with Samojlova and a tantalizing bit of behind-the-scenes footage. Kalashnikov provides a chatty reminiscence (13m:31s) of this, his first major film, with special emphasis on the difficulties in filming the final scene. Zarkhi is represented by an accumulation of miscellaneous footage (2m:21s) that is less than coherent. A segment (10m:28s) shows Plisetskaya dancing, and there is a selection of footage of Gritsenko onstage in various productions (11m:28s). The balance of the featurettes are devoted to modern interviews with Samojlova, Lanovoy, Yuri Yakovlev (who plays Anna's brother Stiva) and Goldayev. Lanovoy's is by far the most interesting, since only he makes clear reference to how troubled a production this was, with roles constantly being recast and scenes being reshot over and over. Clearly there are more tales to be told of this production, but only he seems to be willing to talk. A set of filmographies and bios include five embedded trailers, and a meagre photo gallery includes 10 stills (in anamorphic widescreen). It's an excellent package, though a commentary from experts on Tolstoy and/or Russian cinema would certainly have been welcome. One of the finer attempts at Tolstoy's novel, with a large assortment of supplemental extras, but the source materials are seriously problematic.